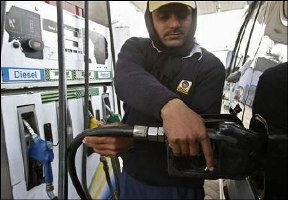 Government will pay fuel retailers Indian Oil Corporation, Bharat Petroleum Corporation and Hindustan Petroleum Corporation Rs 11,000 crore (Rs 110 billion) in subsidy for the first quarter. Fuel retailers sell diesel, domestic LPG and kerosene at government controlled rates which are below market price. The loss they thus incur is made good through cash subsidy from the government and dole from upstream firms like Oil and Natural Gas Corporation. "For April-June the government has sanctioned Rs 11,000 crore subsidy," an official said here. Of this, IOC will get Rs 6,076 crore (Rs 60.76 billion), BPCL Rs 2,407 crore (Rs 24.07 billion) and HPCL Rs 2,517 crore (Rs 25.17 billion). During April-June, the three fuel retailers cumulatively lost Rs 28,690.74 crore (Rs 286.9 billion) on the three fuel. Of this, the upstream firms ONGC, Oil India Ltd and GAIL have been asked to meet Rs 15,546.65 crore (Rs 155.46 billion) or 54 per cent of the under-recovery or revenue loss. After accounting for government cash subsidy, fuel retailers are still left with about Rs 2,145 crore (Rs 21.45 billion) of unmet losses. Of the upstream share, ONGC has been asked to chip in Rs 13,200.10 crore (Rs 132 billion). This is 4.5 per cent higher than Rs 12,622 crore (Rs 126.22 billion) it had paid in first quarter of previous fiscal, he said. OIL has been asked to provide Rs 1,846.55 crore (Rs 18.46 billion) while the share of gas utility GAIL has been fixed at Rs 500 crore (Rs 5 billion). The official said out of the upstream dole, IOC will get Rs 8,107.21 crore (Rs 81.07 billion), BPCL Rs 3,830.56 crore (Rs 38.3 billion) and HPCL Rs 3,608.88 crore (Rs 36.08 billion). Of the Rs 28,690.74-crore (Rs 286.9-billion) revenue loss in April-June, fuel retailers lost Rs 12,129 crore (Rs 121.29 billion) on domestic LPG, Rs 9,037 crore (Rs 90.37 billion) on diesel and Rs 7,524 crore (Rs 75.24 billion) on kerosene sold through public distribution system. Oil firms are currently losing Rs 1.33 a litre on diesel, Rs 32.98 on PDS kerosene and Rs 447.87 on domestic LPG, he said, adding at the current rate the three firms are likely to end the fiscal with an under-recovery of Rs 91,665 crore (Rs 916.65 billion). IOC lost Rs 15,328.34 crore (Rs 153.28 billion) on sale of the three products in Q1, HPCL Rs 6,620.01 crore (Rs 66.2 billion) and BPCL Rs 6,742.39 crore (Rs 67.42 billion). Last fiscal, oil firms had lost Rs 1,39,869 crore (Rs 1,398.69 billion) on sale of diesel, PDS kerosene and domestic LPG. Image: A worker at a petrol pump.